What are the Procedures and rules to follow while implementing Positive Reinforcement Programme ? If your data reveal that the worker makes the correct response at least once in a while, you need to design a programme that will increase the percentage of correct response. As in anything else there are some basic, general rules that you must master before you implement such a programme. The only way to increase behaviour without alienating the employee is to make it more rewarding to perform effectively. Before you can change the contingencies in favour of the desired behaviour, you must identify what the employee finds reinforcing. You can only discover this by observing what the employee prefers to do and how he reacts to various rewards. The greatest danger at this point is in managing and the language of the employee. If you think that you can assume that money, praise attention recognition, time-off, or any other common reward is necessarily a reinforcer for an individual employee, you are probably overgeneralising your way into failure as a behaviour manager. Remember that by definition a reinforcer increases the probability of the preceding behaviour. If the frequency of the behaviour doesn't increase, your reward wasn't a reinforcer. The kind of manager who is likely to be reading this chapter is also the kind of manager who would have trouble accepting next week as an extra paid vacation because he would believe that the lost time would interface with his performance. For such a manager both money and time-off fail to function as reinforcers. The language of the employee leads a behaviour management project astrally when the supervisor decides that he can ask the employee what would be reinforcing rather than directly observing the effects of various rewards. Verbal behaviour is never a substitute of actual observation. At best the questionnaire approach can waste time and create paper work. At worst, it can lead the manager to punish the very behaviours that he wishes to reinforce by using the wrong opportunities as rewards for the right behaviour. Asked in the abstract, our hard-working manager might say that he would love an extra paid week off but this consequence might not reinforce when it came down to taking the time. In the research for rewards, attitude surveys may point a manager in the appropriate direction, but only direct observation of behaviour will identify specific effective reinforcers. The base rate will tell you which consequences have led to an increase in productivity for that specific employee in the past. Nonetheless, if each manager had to start from scratch to identify unique rewards for every employee it would be a monumental task. Fortunately, a number of consequences have been identified that are likely to serve as reinforcers for most workers. Approval, social recognition, money, feedback on their performance, independence, participation, time-off, and increased responsibility offer a good place to start looking for possible rewards. One must remember though, that for any individual employee none of these rewards may be reinforcing. The variety of rewards at the manager's disposal is quite extensive. Finding out what the employee finds reinforcing is not the only trick to reward identification. There are two other rules that are helpful in reward selection. Introducing new rewards workers better than trying to get more work from the old ones. When you put in a new programme that utilizes reinforcers that had previously been freely available, you are inviting disaster. If you have always given everybody who worked for you a Diwali bonus but now decided to make them earn it based on some productivity figures, you are actually removing the rewards that were in effect for just showing up. You have put the response of attending work on extinction because it is now necessary to make additional response in order to gain that same reward. Extinctions is known to produce emotional behaviour. Your worker will get upset if something that they could take for granted is now restricted so that it must be earned. If you watch the union reactions to give-backs at contract time, you know how emotional these reactions can be. It really is not necessary to risk this emotional reaction in most cases of reward selection because there are plenty of potential. rewards that go unused. In most organisations praise is so rarely offered that there is no reason to believe that employees will feel bad about being given the opportunity to earn it. The second limitation is choosing reinforcers reflects the need to establish a lasting programme. Rewards that occur naturally are more effective in the long run that artificial rewards (Colins, 1981). Industry has an abundance of natural rewards to choose from. Everything from praise to profit-sharing can be made available naturally. Several systems have been developed in which a fraction of the saving over anticipated expenditure is distributed to the workers for improved performance. This kind of system is preferable to one time, tangible reinforce offered as short-term productivity incentives. If you want brief effects or a boost to get the programme going, short-term artificial rewards can be quite useful. The sales competition for the proverbial cruse to desired destination like Maldeeves gives the employees something to work for until the more natural reinforces take over. Most companies would be hard pressed to give out a trip to the islands for every competent performance every week. If your interest is in enduring high-level performance, you must have a programme of on-going, naturally available rewards. For a reward to really be a reinforcer there must be enough of it to justify the employee's activity. Most of us would find Rs. 5000 rewarding, but if we had to walk 10 miles for it, it would probably not be enough of a reward to increase the probability of that behaviour, In other words, it would not be a reinforcer. It is often the case that when someone suggests providing rewards for appropriate employee behaviour, a manager will report that the company already provides incentives. Closer inspection reveals that the worker can, for example, earn a certificate for perfect attendance or a commendation for a suggested improvement. The simple truth is that these rewards are not large enough to justify must efforts by the employee, when the company makes thousands off a suggestions. Some years ago Jones and Azrin (1973) noted that a job locator fee of $ 100 netted the Illinois State Employment Service eight times the number of jobs that were reported when a firm hand clasp was the only reward. Providing reinforce is probably a necessary condition for producing behaviour change but it is not sufficient to be effective in an of itself. A major problem in many organisations is that the primary reward-‘salary’ is based on presence rather than performance. As a result of this arrangement, many employees appear to see taking up space at their desk as their primary functions. One might indeed ask: Why shouldn't they feel that way? After all that is what they get paid for. The only time they don't get paid is if they don't show up, so the positive consequence (salary) is obviously contingent only on the response of being present. No reward is useful if it is contingent on the wrong behaviour. A good example of the non-contingent use of a potent reinforcer has occurred in tipping. The gratuity could be a potent reinforcer for a good service if it were contingent. on that behaviour. Unfortunately, most customers tip a standard amount whether the service was superb, adequate, or perfunctory. The net effect is that the waiter, porter, or paperboy expects a tip regardless of performance. The provider will view the size of the tip as a trait of the customer ("a good tipper") rather than as feedback on his work. It is not only the gold watch at the end of fifty-years service that violated this principle. Any delayed reward is likely. to be perceived as unconnected to the work behaviours for which it was delivered. For the salesman on commission or the factory piece worker the only way extra money can continue to function as a reinforcer is if the employee keeps some count of how much he is earning. If he is keeping track of his production, each time that he adds to his count is a reinforcing event. They pay at the end of the month makes such record keeping rewarding, but the immediate knowledge of increased income on the horizon is the reward for the actual work behaviours. Obviously then, if you provide such employees with immediate feedback on how much they have earned, you should get increased productivity. The immediate principle (Rule 6) holds within it is second obvious necessity for administering rewards. On the face of it, the notion that he reward, must follow the desired behaviour seems so simple minded that it is not worth mentioning. It would indeed be a trivial point if managers didn't so often violate it. As a simple example of this kind of backward conditioning take the college faculty member who is granted tenure or promotion after promising his chairman that he will spend, more time on campus and give more preparation to his classes. Of course, the professor's habitual behaviour does not undergo a miraculous change after the reward is delivered. Having thrown away his reinforcers noncontingenily, the department chairman finds that the professor's behaviour gets even worse and finds himself bitterly muttering something about the faculty's lack of "gratitude". It is interesting to note that in both the cases in which we have observed this phenomenon, the chairmen were industrial psychologists. You would have expected them to know better, but they didn't. No organism works for rewards that it already has. Rewards must be earned before you give them out not afterward. 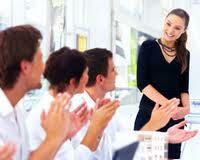 The most common contingent reward systems in industry are those commissions arrangements that rewards sales personnel. Such programmes represent a highly successful use of contingency principles, but they could be even more effective. The key to behaviour management through contingent reinforcement is to reward appropriate behaviour. The usual sales commission system rewards not behaviour but the results of the salesman's actions. Like early management by objectives theory, it gives the salesman feedback on where to go but no information on how to get there. With such a system the salesman is able to identify who gets results but not what behaviours are effective. As a result sales managers are forever searching for born salesmen, but they are unable to each good sales behaviours. The cure for this problem is embodied in Rule 8. An employee who shows up on time once a month is not likely to gain a reward that is offered for a years of being prompt. Such a reward might just as well not exist for that employee. On the other hand, if he is rewarded for being on time once a week, you are likely to produce a significant increase in punctuality. Both the manager and the employee must recognise that these rewards are but a step on the road to acceptable levels of performance. Yet this is a step that cannot be skipped. It is of the utmost importance. If the manager institutes a programme of rewarding only perfect behaviour, he better not hold his breath waiting for it to develop. Starting at the current level of the employee is not only absolutely necessary if you are going to have any effect, it is a practical guide pro-improving what otherwise would appear to be hopeless behaviour. It forces the manager to uncover what the employee is doing correctly so that he knows where to begin his rewards system. In so doing it provides the gray area between the manager's white of perfect performance and his black of that guy never does anything right. "Even the terrible employee does some part of his job better than he' does other parts". Starting to reward at his current level you begin by reinforcing his when he performs less poorly than he usually does. "As Brethower notes, you can tell him that it is exceptionally good performance that is being rewarded because for his even minimal improvement is exceptionally good". Just as you must begin to reinforce behaviour that the employee is currently doing well, it is most appropriate to increase the behavioral demands for rewards very slowly. These two principles are based on the fact that you are trying to correct a deficiency. The employee who has been doing poorly is not likely to have been receiving much in the way of rewards for his efforts. He has been in act on extinction because his work performance has not been good enough to get reinforced. He is likely to have given up any hope of being rewarded. Any large increase in what is demanded of his will result in extinction occurring again because he will quit before he accomplishes enough to get rewarded. The manager must make sure that correct work behaviour does not go unrewarded. If he is too stingy with his rewards or try to move too quickly in bringing the employee's behaviour up to criterion, the employee will fail to get enough reinforcement' to keep him going. The early Emery Air Freight manual Positive Reinforcement (1971) makes a strong case for the importance of rewarding early and often. Emery's managers are told that "any response the individual makes, however slight, toward the goal should be recognised as very important and should be strongly reinforced. This is true even if there are many steps on the behavioral scale yet to be exhibited. (You may appear to be a long way from the results goal, but you really are not). The steps that we have described so far have dealt with reinforcers and when to apply them. We have done little with the all important topic of what to reward. The simple answer is to reward the behaviours that you want and stop looking for the behaviour that you want to increase. The key concept is to look for the behaviours that you want and stop looking for the behaviours that you don't want. Lists of "Don'ts" are the most obvious incorrect examples at this step. The objectives must be stated in Positive terms only.